Eco-friendly bags come in a variety of materials like biodegradable plastic, paper, or reusable fabric. They can be used in grocery stores, take-out counters, liquor stores, and bakeries. 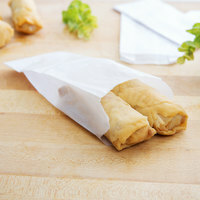 Paper bags come in different sizes, colors, and hold a range of capacities. Also make sure to check out other great items from Choice, Green Herc, Kari-Out Company, Duro Bag and Elkay Plastics. Stocking eco-friendly bags is a great option for businesses that care about the environment. Reusable bags are the perfect impulse-buy item to keep near your checkout counter for customers who forgot their bags. 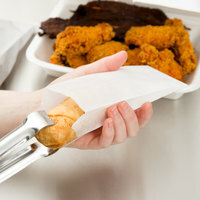 Perfect for packaging groceries, lunches, liquor bottles, or merchandise, paper handled bags are sturdy and easy to carry. For other eco-friendly supplies, check out our eco-friendly paper cold cups, biodegradable, compostable straws, and eco-friendly paper towels. If you're wondering where to buy kari-out company eco-friendly bags, we have a large selection of kari-out company eco-friendly bags for sale at the lowest prices.